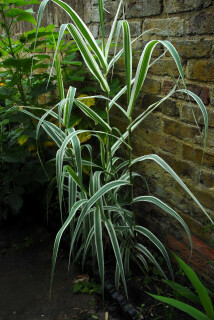 Arundo donax variegata, also known as 'versicolor' is as the name would suggest a variegated version of the giant reed. It is smaller in stature, slower growing, less hardy and significantly less invasive than its green cousin. Having lost this plant a number of times to frost when grown in the ground, it was decided to have a further attempt at growing this plant in a container. 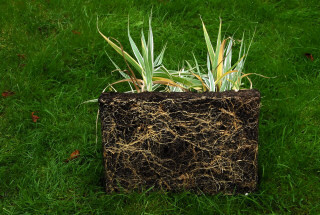 For the first season, the plant grew well in its container. In subsequent years the performance tailed off. The pot became root bound leaving less and less room for watering/feeding. So although the plant was surviving the winters, its appearance made you wish it hadn't. 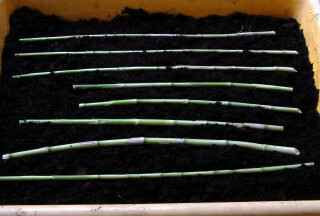 With nothing left to loose an attempt was made to propagate the Arundo donax variegata by means of stem cuttings. 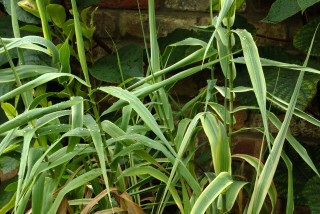 In late February the stems were removed form the plant. All the leaves (which at this stage were brown) and loose casings were stripped from the canes. 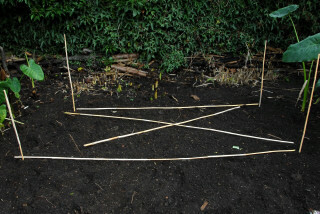 The canes were laid horizontally on some multi-purpose compost in a solid tray (no drainage) and covered. The compost was moistened, the tray covered with cling film and placed under the bench in the greenhouse. By mid April small shoots had begun to appear at the nodes on the canes. 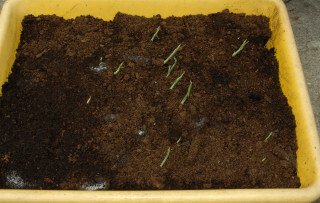 Unfortunately the choice of tray and compost used for this experiment was not the best and the shoots soon died. It was difficult to maintain an even level of moisture in the tray with out any drainage holes and pure multi-purpose compost is notoriously bad at accepting water in a dry state. Anyway the beauty of gardening is that there is always next year. A similar procedure was carried out the following February. A cat litter tray with drilled drainage holes was used. The tray was covered with chicken wire to deter any curious squirrels. The whole thing was left outside in a full sun position. All in all this attempt was much more successful. The experiment would have been more so had the tray not been neglected during a warm period during the early stages. 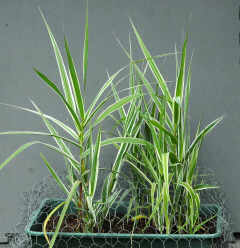 By mid October the Arundo donax variegata stem cuttings were exhibiting a healthy root system. The cuttings were planted out in their entirety in October. The period in between these two shots, the stems of the original cuttings were removed and laid directly in the soil of the same flower bed. These stems however failed to sprout. (This could have been that they were just too thin with insufficient reserves). 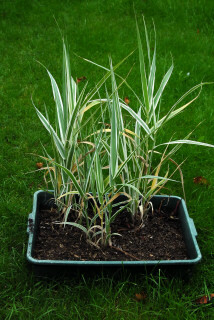 One vaguely interesting point is that the variegation was a clean white when the plant was grown in the soil and much creamier in colour when grown in the container. A further experiment awaits the stems of this plant and any future successes will be posted here. 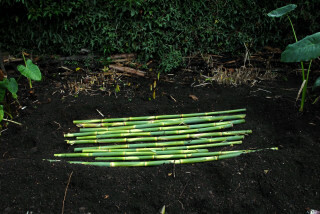 Canes were cut in mid December, cleaned of leaves and laid into a hollow on the soil. Soil was raked over the top. The position was clearly marked to ensure the local foxes would know exactly where to dig. 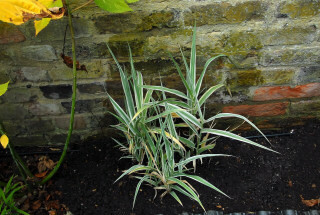 By mid May the canes were sprouting, although at this stage no sign of root formation was evident. No doubt roots would have appeared in due course. 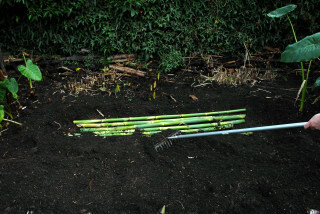 However the space was needed by this stage so the canes were removed, shredded and added to the compost heap. The same experiment was conducted simultaneously with stems of Miscantus floridulus but failed to produce any growth whatsoever.